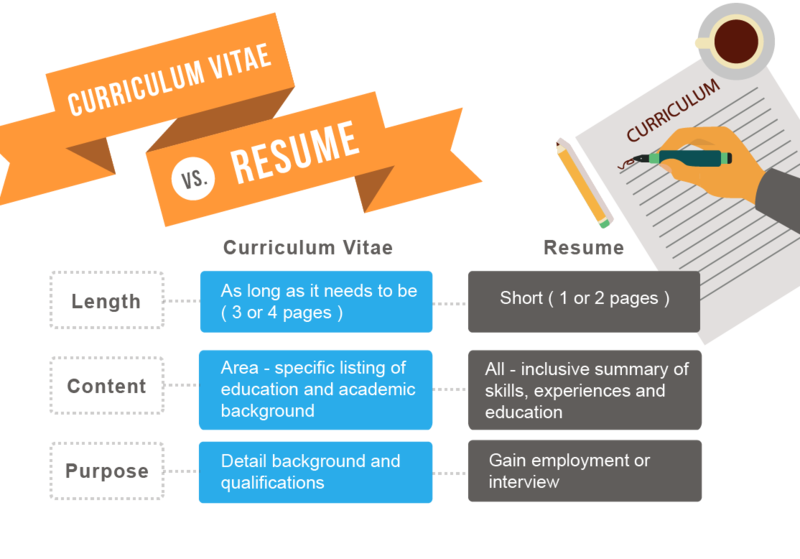 CV vs Resume: What's the Difference Between a Resume and Curriculum Vitae? A resume is a living document that should be customized for every job. A curriculum vitae (CV) is a comprehensive document you may not change for months or years. There are other differences: Length, update frequency, format, and focus. Resumes are short documents, usually only one or two pages total, that concisely list professional experience, accomplishments, and education. A resume typically focuses on work experience. Most common in the U.S. and Canada, resumes should be updated for each and every job an applicant applies for. Since online job applications are submitted through applicant tracking systems, resume keywords , job titles, and accomplishments need to be tailored in order for an applicant to be competitive. Furthermore, while certain positions in your work history may be relevant to one job, they might not be relevant to another. Resumes are constantly in a state of change. There are three ways to format a resume: chronological, functional and hybrid. While a chronological resume format is most common, job seekers have the option to choose the resume format that best represents their unique professional experience. There are a lot of dos and don’ts when it comes to writing a modern resume. For example, while including references is a major “don’t” for resumes, references are a big “do” for CVs. “Curriculum vitae” means “Course of Life” in Latin. That translation actually describes a CV very well. Where a resume focuses on relevant work experience, a CV covers broader life experience. A CV is always formatted chronologically and unlike a resume, does not change from job-to-job. In fact, CVs remain static and are only updated when the applicant completes a new accomplishment. For example, if the applicant has a new research study published in a reputable journal, they would add the mention to their CV. Job descriptions will typically specify whether to submit a resume or CV. If not, there are a few factors that can help determine whether you need a resume of curriculum vitae. The use of resumes and CVs is primarily regional. Resumes are most commonly used in the U.S. and Canada (though there are exceptions, highlighted below). CVs are typically used internationally, particularly in the UK, Ireland, New Zealand, and across Europe. Even in the U.S. and Canada, there are certain professions that do require a CV in place of a resume. For example, a CV is usually used in academia by PhD candidates, university teaching applicants, and in some post-graduate application scenarios. The main use of a CV in academia is to include publication information. CVs are also common in clinical medical professions. In those cases, research and education are highlighted. On the flipside, a resume will rarely be required in regions where CVs are preferred. However, if you live in the UK or Europe and are applying for a job in the U.S. or Canada, you will likely need a resume. Because a resume and a curriculum vitae serve different purposes, job candidates should consider having drafts of both written and ready to use. A CV can serve as a master resume or career management document. Note: This article was originally published by Trista Winnie on August 19, 2014. It was rewritten for 2018 and republished on October 12, 2018.